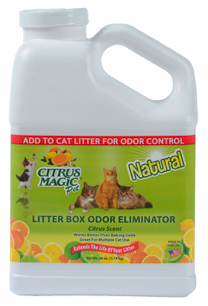 Citrus Magic Pet Litter Box Odor Eliminator doesn't just control litter box odors, it eliminates them! It can be used with any cat box filler to help eliminate odors and freshen the air for you and your pets. Simply add a 1/4 cup per 10 lbs. when you change the litter or sprinkle evenly over the litter when cleaning and mix well. It is so effective, it even works with multiple cats.